There are some things in life that may appear strange, or a bit odd to you. That is something you can certainly say that for this online slot game called Bonanza, which Big Time Gaming has developed and released for every casino gamer in the world to play. If predictability is something that you'd figure every slot game would have, then you should throw that thought out of the window, and expect the unexpected. You wouldn't even expect the developers to set the slot up with hill-billy music playing in the background! Whenever you play a game at a casino online or land-based, you always have your eyes on the prize. What is the prize? Well, the instant wins and jackpots, of course! But which iGaming developer can deliver those instant wins and jackpots without fail? Well, you can only count on 1, and that is Big Time Gaming. Having a pretty big history on being associated with some of the world's largest operators in the casino industry, you know they're not lying when they say that they're are 1 of the best. And after creating some fantastic slot games like White Rabbit, and scratch cars like TapCards, it's impossible for you to think that Bonanza is just like any other ordinary game online, especially if you haven't even played it yet! Unlike most slot games, you'll see a cart of symbols rolling above the grid that could alter the course of the game at any given moment. You may feel like it covers the whole game, but it actually just covers the 2nd, 3rd, 4th, and 5th reel. To make the gameplay even more bonkers, the developers implemented a couple of SCATTER symbols that you should look out for. Gold SCATTER: To get this symbol on your reels, you literally have to spell out the word. You'll need all of the letters to start the feature, but once you do, you'll be rewarded with 12 extra games. 5 SCATTER: if you see this symbol on any of the reels, you'll receive that number of spins and add it to your total amount. The aim of the slot is to get further underground through the means of mining, and every time you blow up 1 section of the mine, your multiplier increases in value. Already confused by the description of this game? I'm not surprised! But you have to hand it to Big Time Gaming for thinking out of the box with this online slot game, who were also able to apply a numerous amount of ways for a player to win big prizes. And even though Bonanza may appear a bit strange to you, it certainly doesn't appear boring! 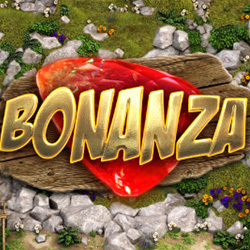 So, even if you're not the biggest slot gamer in the world, just try Bonanza out to see how crazy it can get on your laptop, tablet, and smartphone!